This is a fresh, crisp and very drinkable beer. It is excellent to be able to get this in the UK, and no courier is more welcome than the bloke carrying a case of Carlton Cold to the door. It's one of many beers that doesn't give me a rotten hangover the next day. It is clean, crisp and enjoyable. As an Aussie I'm pleased that so many enjoy my country's product. Cheers! 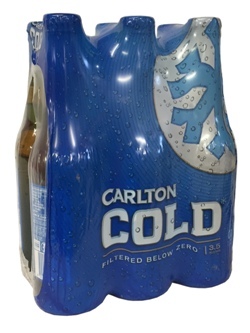 I was introdued to Carlton Cold on my first trip to Perth in 2001, and have since have always had a few bottles in reserve. Best served ice cold, it has a clean crisp flavour and goes down very easily.